Hillary Rodham Clinton says her husband's relationship with Monica Lewinsky caused so much pain that, at one point, Buddy the dog was the only member of the family willing to keep President Bill Clinton company. The former first lady declares in her new memoirs that, "As a wife, I wanted to wring Bill's neck," but she finally resolved that she loved him, wanted to keep the marriage intact and supported what he was doing as president. Mrs. Clinton vividly describes her pain over the betrayal in "Living History," covering her eight years in the White House. A copy of the book, which goes on sale Monday, was obtained by The Associated Press. She recounts two bedside conversations seven months apart. In the first, the morning of Jan. 21, 1998, the president sat on the edge of the bed and told her the Lewinsky story was coming out and it wasn't true. In the second, Aug. 15, 1998, the weekend before he testified about his relationship with the intern to a grand jury, the president woke her, paced the floor and said there was truth to the allegations after all. "Why he felt he had to deceive me and others is his own story, and he needs to tell it in his own way," she writes. Asked Wednesday about her book's account of the Lewinsky episode, the senator from New York said only: "I hope people will read the book. This book is about many things." Speaking outside her Senate office, she said of the keen interest in her story: "I worked very hard on it — to talk about my growing up, my values, my beliefs. And I think all of these questions people will be able to answer for themselves within the context of the entire book." She says in the memoirs that the most difficult decisions she has made in her life were to stay married to her husband and to run for the Senate. Her 562-page book has been highly anticipated. Simon & Schuster, expecting large sales, ordered an extraordinary first printing of 1 million copies. The first lady-turned-senator was paid a $2.85 million advance toward the $8 million book deal. Foreign rights already have been sold in 16 countries. The book's list price is $28. In it, she acknowledges tears and turmoil, balancing her personal struggles to deal with a wayward husband with her political obligations as first lady and Senate candidate. She says she accepted her husband's story at first — that he had befriended the White House intern when she asked for job-hunting help, had talked to her a few times — and that the relationship had been horribly misconstrued. But on the Saturday morning before his testimony, he "told me for the first time that the situation was much more serious than he had previously acknowledged." "He now realized he would have to testify that there had been an inappropriate intimacy," she said. "He told me that what happened between them had been brief and sporadic." "I could hardly breathe. Gulping for air, I started crying and yelling at him, 'What do you mean? What are you saying? Why did you lie to me?' I was furious and getting more so by the second. He just stood there saying over and over again, 'I'm sorry. I'm so sorry. I was trying to protect you and Chelsea,"' their teenage daughter. 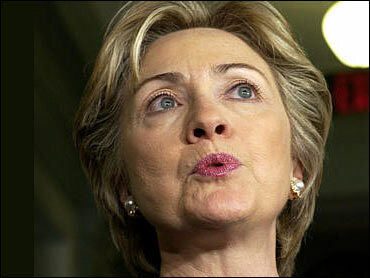 Mrs. Clinton said that up until that August morning when her husband confessed, she believed he was being railroaded. She hadn't believed he would jeopardize their marriage and family. She describes in bitter terms the months of chill between them afterward, never more painful than when they went to Martha's Vineyard in Massachusetts for a vacation following his testimony. "Buddy, the dog, came along to keep Bill company," she writes. "He was the only member of our family who was still willing to." While on the island, she felt "nothing but profound sadness, disappointment and unresolved anger. I could barely speak to Bill, and when I did, it was a tirade." He slept downstairs, she slept upstairs, she said. She said her decision to run for a Senate seat provided a healing bridge for them, allowing them to talk about something other than the future of their relationship. Clinton was the first first lady to run for elected office, and was sworn into the Senate the same month her husband left office in January 2001. She recounted their last day at the White House, waltzing down a long hallway in her husband's arms. She concludes that what her husband did was morally wrong but not a betrayal of the public. Clinton said that every First Lady in recent times has written an accounting of her time in the White House. "Although it's not history, it is one person's view of the experience," she said. "I found all of those books by my predecessors to be interesting, insightful, and helpful. So for me writing the book was separate from being a Senator. My job as a Senator requires the kind of hard work I've tried to do with my colleagues...it's not affected in any way by this book coming out."